DR.MANFRED GERSTENFELD INTERVIEWS NETHERLANDS CHIEF RABBI BINYOMIN JACOBS……… – The Tundra Tabloids……. 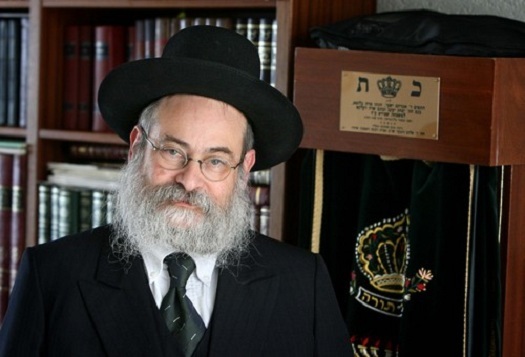 Dr.Manfred Gerstenfeld’s interview with Chief Rabbi Jacobs of the interprovincial rabbinate in The Netherlands. This was first published in Israel National News, and republished here with permission from the author. Chief Rabbi Binyomin Jacobs is head of the IPOR — the Rabbinate for the Jewish communities outside of Amsterdam — and also the Rabbi of the Sinai Center, the only Jewish psychiatric hospital in Europe. He has been interviewed by several Dutch media on the anti-Semitism he experiences and by Arutz Sheva in the past..
“I perceive that the aggression against Jews who are recognizable by their dress has increased greatly. On the other hand, there is also an increase in sympathy toward us. When I enter a train, someone may just shake my hand and say ‘Shalom’ or something positive about Jews and Israel. “Developments in the Netherlands are worrisome. Whenever something dramatic happens in Israel, people start shouting at you ‘Israel’ or ‘Hamas, Hamas, Jews to the Gas.’ Once I had a very shocking experience. A non-Jewish psychologist and I entered a train full of Feyenoord soccer fans. They started to chant: ‘Jews to the gas.’ I had the feeling that this whole train of ‘ordinary Dutchmen’ was against us. “Across from our house is a school with children who come from greatly varied backgrounds. One day a Turkish lady walked up to me, holding a young child tightly by the hand. The child looked deathly afraid. The lady said to the child, ‘Don’t be frightened, this grandfather won’t hurt you. He’s a nice man.’ The boy seemed to be of Moroccan origin and thought that I would kidnap him. He had apparently been told that Jews are dangerous. That lady wanted to teach him otherwise. “Such feelings are heightened because in the mosques here, a film was shown in which Israel is falsely accused of kidnapping Arab children to give their eyes to Jewish children. Afterwards, the Arab child is blind and the Jewish child can see again. A kid who has heard this is obviously afraid. “At a kindergarten, a three year old child from Somalia called me ‘a dirty Jew.’ I cannot debate with a small child! The teacher who was Dutch went to speak with the child’s parents about this incident. Altering such behavior however demands a major cultural change! “The authorities do far too little about the criminality against Jews. One New Year’s Eve, hooligans shouted in front of my house, ‘Jews Jews’ and started to destroy my gate. I called the police, who arrived an hour and a half later. “The Board of the Rabbinate decided that I need to have an alarm system at home which is connected directly to the police station. Initially I thought this was nonsense. But the system was put in nevertheless. I am not afraid, but it surprised me that I felt more secure with the alarm. This feeling in itself frightened me. I don’t go to bed anymore without putting the alarm on. “A major problem for the Jewish community is that the Dutch media is also anti-Israeli. They use expressions which are a new type of anti-Semitism. I try to correct that as much as possible. I remember a big photograph in the local newspaper Amersfoortse Courant of an Israeli tank. The article said that it had run over and killed a Palestinian. Next to it was a small news item about how during that same week in another country, 200 executions had taken place. This is a shortened version of an interview which appeared in Dutch in Manfred Gerstenfeld’s bestselling book “The Decay: Jews in a Rudderless Netherlands”. Dr. Manfred Gerstenfeld. The writer has been a long-term adviser on strategy issues to the Boards of several major multinational corporations in Europe and North America. He is the Chairman of the Board of the Jerusalem Center for Public Affairs. Previous Post Previous Post TOMMY ROBINSON ATTACKED BY MUSLIMS IN LUTON……..
Next Post Next Post RAYMOND IBRAHIM: IRAQ’S CHRISTIAN COMMUNITY IS NEAR EXTINCTION……. When I read articles like these I am ashamed to be Dutch. The unwillingness of many to protect Jewish citizens from vicious attacks is disgraceful.